March 6-8 – ACC Coal Spring Forum to be held at Sandpearl Resort & Spa, Clearwater Beach, FL. 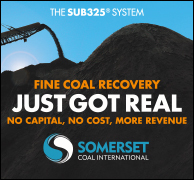 For further information, please visit www.americancoalcouncil.org. March 10-13 – Haulage and Loading 2019 to be held at Hilton El Conquistador Resort, Tucson, Arizona. Visit www.haulageandloading.com. March 20-21 – West Virginia Coal Mining Institute Annual Meeting to be held at Embassy Suites, Charleston, WV. Meeting begins with the West Virginia Coal Hall of Fame Banquet on the Wednesday evening and continues with the Technical Sessions at 8:00 am till 5:00 pm on Thursday. For further information please contact Jim Dean, Secretary-Treasurer at 304-276-0591 or James.Dean@mail.wvu.edu. March 20-22 – 17th Annual Conference on Carbon Capture, Utilization and Storage, to be held in Gaylord Opryland Resort, Nashville, TN. Theme of the meeting is “Advancing CO2 Emission Reduction Systems to Achieve Global Reduction Goals, Meet Electricity Needs, and Utilize Domestic Resources”. For further information, visit www.exchangemonitor.com. March 21 – Tug Valley Mining Institute Meeting to be held at Logan Country Club. Speaker Mike Day, ArcellorMittal Mining. Sponsor JH Fletcher. For further information, visit www.tvmi.us. March 28 – 7th Annual Professional Engineers in Mining Seminar presented by Virginia Coal & Energy Alliance and held at Lebanon, VA. For further information, please phone 276-889-2262, e-mail barb@viginiacoalenergy.com, or visit www.viginiacoalenergy.com. April 4 – Kanawha Valley Mining Institute Meeting 6:30 pm to be held at Holiday Inn and Suites-Charleston West, 400 Second Avenue, Charleston, WV. Speaker TBA, sponsored by Strata Worldwide. For further information, please visit www.kvmi.org. April 8-12 – CEDAR (Coal Education Development and Revmi.org. source) of Southern WV 17th Regional Coal Fair to be held at Chief Logan Convention Center, 9am - 8pm. Fair closed April 9 for judging. For further information, please contact Debbie Mudd 304-357-5709 or visit www.cedarswv.com. April 8-14 – bauma 2019 to be held in Messe Muenchen, Munich, Germany. For information visit www.bauma.de. April 11 – Tug Valley Mining Institute Meeting to be held at Logan Convention Center in conjunction with the CEDAR Coal Fair. Speaker Jim Bunn. Social hour 6-7 dinner 7. For information please phone 304-792-8433 or visit www.tvmi.us. April 12-13 – SME Central Appalachian Section Spring Meeting to be held at Marriott Griffin Gate Resort, Lexington, KY. Topics include: After Market Equipment Automaton, Changes and Developments in the Coal Industry, and Advanced Miner Training. For further information please contact Geaunita Caylor at g.caylor@uky.edu or 859-404-1621. April 15-18 – 37th Annual South Central Joint Mine Safety and Health Conference, to be held at Hilton Anatole, Dallas, Texas. For further information, please visit www.scjmhsc.org. April 17-18 – World CTX 2018 Conference, co-organized by the National Institute of Clean & Low-Carbon Energy to be held in Beijing, China. For further information, please phone 33+607 28 5247, or visit www.worldctx.com. April 23-26 – 2019 Electric Power Conference & Exhibition to be held at Gaylord Opryland Convention Center, Nashville, TN. co-locating with the 2018 Carbon Capture Utilization & Storage Conference. For further information contact Jill Dean at 713-343-1880. April 24-25 – RMCMI Joint Texas and TRA Regional Meeting, to be held in Hide-a-Way Lake Club, Hideaway, Texas. Short Course and dinner on April 26th. Golf on April 27th. For further information, please phone Judy Colgan at 303-948-3300, or visit www.rmcmi.org. April 28-May 1 – 17th North American Mine Ventilation Symposium, Montreal, Canada in conjunction with Canadian Institute of Mining, Metallurgical and Petroleum Engineers (CIM). For further information, please phone 303-273-3704. Abstracts are due by May 1, 2016. Please submit abstracts here. May 1-2 – RMCMI Arizona and New Mexico Regional Meeting to be held at Marriott Farmington, Farmington, NM. For further information, please phone Judy Colgan at 303-948-3300, or visit www.rmcmi.org. May 6-9 CIM 2018 Convention to be held at Vancouver Convention Center, Vancouver, British Columbia, Canada. For further information phone 514-939-2710 ext. 1333, email cim@cim.org, or visit www.convention.cim.org. May 7-8 – RMCMI Utah Regional Meeting, to be held at Price, Utah. Visit www.rmcmi.org. May 9-11 – 9th Annual New Mexico Mine Health and Safety Conference to be held in Albuquerque, NM. Theme “Be Safe for Life, Your Life” with Monday session “Dig Into Safety”. For further information, please visit www.nmminesafety.com. May 16 – Tug Valley Mining Institute Meeting and Scholarship Presentations. Logan Country Club, Chapmanville, WV. Social hour 6-7 dinner 7. Scholarship meeting. Speaker TBD. Sponsor TBD. 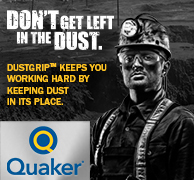 For further information, please phone 304-792-8433, email wvprocoal@yahoo.com, or visit www.tvmi.us. May 20-21 – VCEA 40th Annual Conference & Expo to be held at Marriott Meadowview Conference Center, Kingsport, TN. Includes Golf Outing. For further information, please phone 276-889-2262, e-mail barb@virginiacoalenergy.com or visitwww.virginiacoalenergy.com. May 20-22 – Longwall USA 2019 to be held at the David L. Lawrence Convention Center, Pittsburgh, PA. For further information visit www.longwallusa.com. June 3-7 – 9th International Conference on Clean Coal (CCT2019) presented by IEA Clean Coal Center to be held at Houston, TX. This leading forum for innovation in the coal industry is a truly international event welcoming over 250 delegates from 30 countries to hear about technologies which reduce the environmental impact of coal and the future outlook of the coal sector worldwide. Visit www.cct-conferences.org. June 6 – Annual Virginia Governor’s Mine Rescue Contest to be held at UVA Wise, Wise, VA. For further information, please contact VCEA phone 276-889-2262 email barb@virginiacoalenergy.com or visit www.virginiacoalenergy.com. June 13-14 – AIMS 2019 4rd International Conference, “Mines of the Future” to be held in Aachen, Germany. For further information, please e-mail aims@mre-aachen.de, phone +49+241+80+95673, or visit www.aims.rwth-aachen.de. June 14 – Friends of Coal West Golf Tournament, Craig, Colorado. For information, visit www.rmcmi.org. June 17-22 – Montana Tech’s What a Blast! 2018 Mining Camp recruiting future mining engineers. Fifteen junior and senior high school students may apply before April 10 to pconrad@mtech.edu or visit www.mtech.edu/academics/mines/mining/summer-camp. June 23-25 – Rocky Mountain Coal Mining Institute 115th Annual Conference, to be held at Hotel Talisa, Vail, Colorado. For further information, please phone Judy Colgan at 303-948-3300, or visit www.rmcmi.org.